THE SEVEN OF CUPS – This is the “can’t make up my mind” card. Suddenly, the chooser is not in control. You are in the power of the choices. And there is one other problem: not all of the choices may be as good as they look. This is a card of illusions, deceptions. Making a hasty decision, therefore, could be as bad as being unable to make any decision. How to take control here? Hold out, investigate. Don’t let the cups be in control. How ever much pressure there seems to be, don’t let them force a rash decision. Make an informed and measured decision instead. 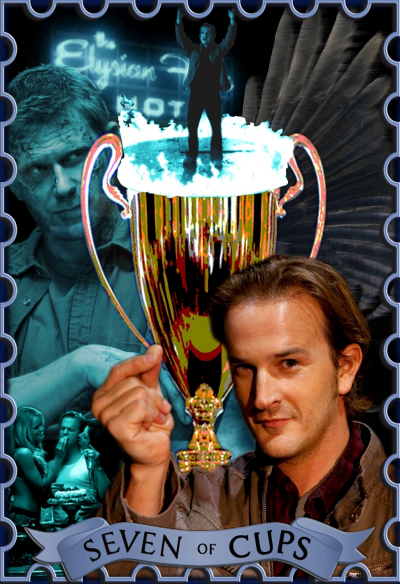 The prompt was Gabriel, and the card is intended to show his choices – between light and dark; his brothers Lucifer or Michael or following the human example being set by the Winchesters; standing up for what is right or lying down to carry on his hedonism and game-playing. Destiny or free will….